This is free WordNet 3 dictionary with Ispell support for indexing inflections. Main accent was made on simplicity and clarity of provided data- only WordNet synsets, similar words and “See also” was compiled in, all the other data like hypernyms, hyponyms, meronyms, holonyms, etc. were intentionally left out. Another important thing was indexing inflections which help to look up word definitions in real text. This dictionary is compilation of several dictionaries- WordNet 3, Babylon and Ispell. Main reason for me to make this dictionary was need for simple and very well indexed dictionary for my e-book reader. Built-in dictionaries were great but I also wanted to add my native language- Latvian. By mixing free Babylon Latvian dictionary (comparably small) with WordNet 3.0 (one of the biggest out there) it was possible to achieve greater range of word definitions and detail than it would be possible just by using Latvian dictionary. Also WordNet synsets were used to expand Latvian definitions to synsets that didn’t have Latvian definition. In addition Ispell spellchecking dictionary was used to add inflections for indexing. Dictionary files can be freely distributed in an original form and without any fee. It is not allowed to edit and/or sell these dictionaries under any circumstances. © Edgars Binans, 2010-2013. All rights reserved. 2016-12-02: Added pronunciation and updated layout for all dictionaries. 2016-10-21: More than 130’000 unique downloads. 2014-01-28: More than 52’000 unique downloads. 2013-08-15: More than 33’000 unique downloads. 2013-01-26: More than 17’000 unique downloads. 2012-12-31: Small visual tweaks for all dictionaries. 2012-05-16: More than 9’000 unique downloads. 2012-05-16: Updated to support Kindle Touch (dictionary language set to EN) and small tweaks. 2011-05-31: Added “WordNet 3 Infused FR” English + French dictionary. 2011-04-25: Added “WordNet 3 Infused IT” English + Italian dictionary. 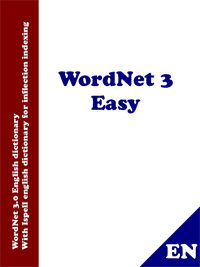 2011-03-30: Added “WordNet 3 Infused TR” English + Turkish dictionary. 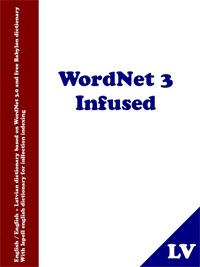 2011-03-02: Added “WordNet 3 Infused CN” dictionaries. 2011-03-01: Added “WordNet 3 Infused TH” English + Thai dictionary. 2011-02-23: More than 1000 unique downloads. 2011-02-21: Updated layout and added “[M]” for all dictionaries. 2011-01-09: Updated LV. Added definitions for “in a(n) ??? manner” (indicated by “[M]”). 2010-12-11: Added “WordNet 3 Infused RO” English + Romanian dictionary. 2010-11-21: Added “WordNet 3 Infused PT” English + Portuguese dictionary. 2010-11-08: Added “WordNet 3 Infused RU” English + Russian dictionary. 2010-11-08: Added “WordNet 3 Infused ES” English + Spanish dictionary. 2010-11-07: Updated “WordNet 3 Infused LV”. Now there is warning “[? ]”, that definition from synset is used; definitions of words and phrases that do not match WordNet has been added. These dictionaries were tested on Kindle Keyboard, Touch, Paperwhite and Kindle Previewer. I have not reviewed nor edited any of these dictionaries and I hold no responsibility for their contents including any historical, political or religious views they may express. Hello, I am currently trying to make my own dictionary, but I am having difficulties how to add inflectionst. Would it be possible to post here or elsewhere a little how to? Thanks in advance. Good job! Inflections in a wordnet .mobi file is exactly what wordnet needs! I can’t wait to try it out. I have a problem though. Could you please post a link to “Wordnet 3 Easy” on mediafire or another file hosting site? The link above to download the english dictionary will not work for me. In ispell distribution look for /languages/english folder. There are files ending with numbers that contain records like “abandon/DGRS” e.t.c. and there is english.aff file that contains instructions how to make inflections for those records (look for “prefixes”, “suffixes”). Paldies! Any plans for an LV-EN version? Wow, wonderful work! Hope someday you add English/English – Spanish. Geetings from Barcelona. @Cori R. Sorry, there are no plans for LV-EN version at the moment. @memetic Added Spanish dictionary. Give it a try! That’s amazing! Big thanks. I can tell you that we Spaniards and Latins (3rd world language) needed something like this. The only free dictionary that we had isn’t very good. In coming days, I’ll promote your dictionary in spanish blogs and forums, be prepared for some downloads. Thanks again. @memetic You are welcome! I’m glad to help and I hope that this dictionary will be as helpful as LV version is helpful for me. Hi, do you think you can make a Romanian one please? I see there is one on Babylon called “RDE- Dictionar EN-RO – cuvinte”. Thank you! This was fast, I will try it tonight. Wow. Can you add english+hebrew? Will bi-directional ltr and rtl work? Thanks! Thanks! I’m using the english+portuguese dictionary and it’s very useful. Dear eb, I’m facing some problems regarding the content of the English-Romanian infused dictionary. Many of the definitions in the Romanian part of the dictionary are wrong, due to the poor quality of the Babylon source dictionary (if necessary I can easily give some examples). Do you still have the time, means and interest, in order to build a new one? I can gladly provide a proper EN-RO dictionary (txt, UTF-8 encoded, Tab separated, approximately the same size as the Babilon one) that I’m successfully using since one and a half year ago. These are great! Any chance of making a English – Polish version? Hi… Would it be possible to read the *.mobi files with a program other than ispell ? Is there any documentation on the mobi format? I would be happy to create a table linking Wordnet3 synsets to french words. Can you make a WordNet English+Vietnamese dictionary? I can’t find any E-V dictionary with Ispell support :(. In my wildest dreams, my Kindle would allow me to see the phonetical transliteration in the short hint at the bottom of the screen which appears when I move the cursor before a word. The dictionaries which come with Kindle do have phonentical transliaterations but I have to open the dictionary to see them, which is slow and often I know the meaning of the word and I only want to see how the word is pronouced. Just downloaded and installed the Chinese dictionary. It looks quite good. Many thanks. Is it possible to create a version for Mac? Hi, do you think you can make a Englisj-finnish one please? I want to change my English-English Oxford default Kindle dictionary with one of these. I want to find words in any book without typing, just with navigation keys. Is that possible? * To other dictionary requests- I haven’t forgot you but I’m so busy lately, please be patient and eventually I’ll get to this. If only these dictionaries would be from foreign languages to English and not the other way round…. 🙁 Thanks anyway! Great work. Would you mind to open the sources of your wonderful dictionaries? I tried to find “Change Primary Dictionary” in Settings section, there is no any option like that. I have Kindle 4, non touch, latest generation. Can you help me?